St.Joseph's Matric. Hr. Sec. 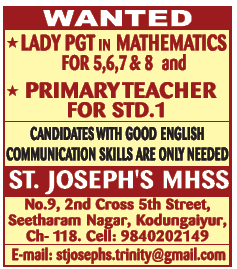 School, Chennai has advertised in THE HINDU Classified newspaper for the recruitment of Teachers PGT / PRT jobs vacancies. Interested and eligible job aspirants are requested to apply immediately from 07th October 2018. Check out further more details below. About School : The school is managed by The Society for Education for Life, a registered society for the cause of charitable purposes and education. This school was established in the year 1993 by our chairman and founder Rev. Fr. Dr. J.E. Arul Raj. It has classes from Pre-KG to Std. XII with English as medium of instruction. Tamil is offered as second language. Hindi or Tamil is offered as a compulsory third language for all the students from Std. III onwards. "A disciplined life with a spiritual base and excellence of men and matters is a right of every child to grow into a powerful citizen of this country".